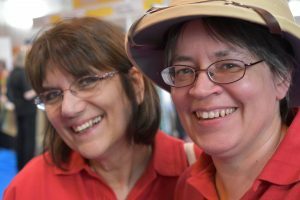 Valmay Young and Beverly Hallam are both trustees of the Families in British India Society (FIBIS) which is a self-help organisation for those researching their family history and the lives their ancestors lived in India during the time of British rule. Valmay is the society’s Website and Social media Manager and has been researching her family history using original and online sources for over 20 years. She also started the FIBIS DNA project in 2012 after realising its potential in breaking down the all too common brick walls in British India research due to the lack of documentary evidence. As FIBIS research co-ordinator, Beverly offers advice and assistance to those who are unfamiliar with the records of British India or who have hit that proverbial brick wall when researching their family tree. With branches of her family stretching back to seventeenth century India she used a variety of resources to unravel her own ancestry and, after many years of also assisting FIBIS members, has examined considerably more. As well as using online data, the FIBIS team of research volunteers regularly visit the British Library or UK National Archives to search for those elusive clues that might lead to a breakthrough.